Build a charcoal fire for direct grilling with Kingsford® charcoal. While the grill is heating cut the onion into round slices, each 1/2-inch thick. Cut the peppers in half and remove the seeds and veins. Place the prepared vegetables and whole tomatoes directly over the hot coals (approximately 500˚F) and cook for 5 minutes, turning once or until they char and start to soften. Remove the vegetables from the grill and dice. Combine the diced vegetables, cilantro, garlic, salt, sugar and lime juice into a small bowl. 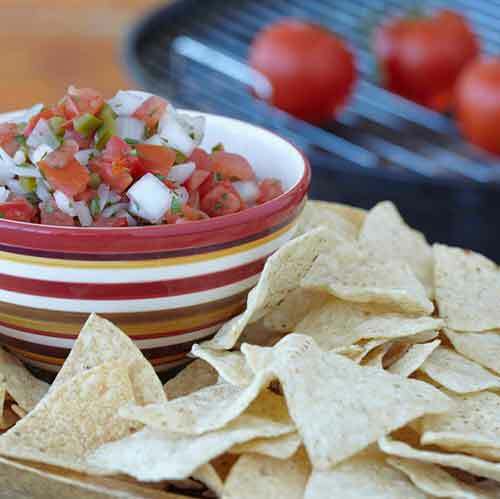 Let the Pico de Gallo sit for 30 minutes so the flavors will meld together. Serve or refrigerate and serve chilled.